Replicated tests have proven SpeedyGreen will reduce, correct, and prevent iron deficiencies in turf. 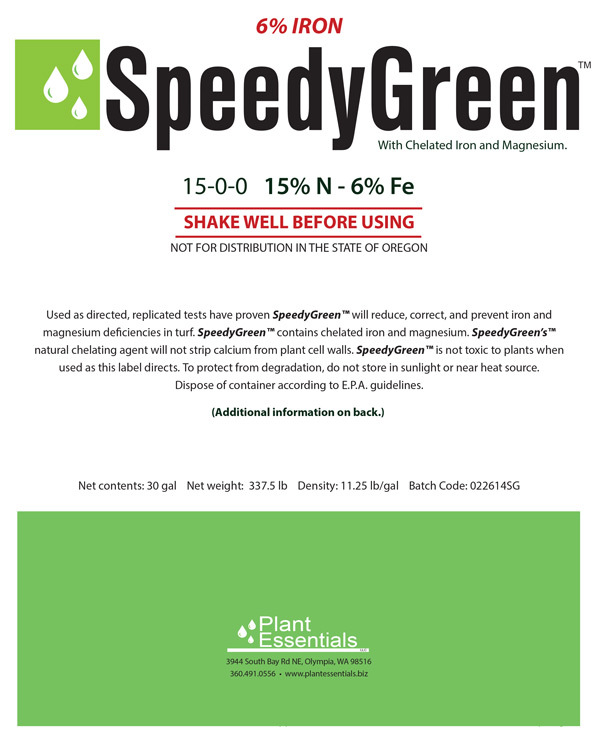 The iron in SpeedyGreen is naturally chelated. Chelation is the process whereby metals, e.g. iron and magnesium are protected from oxidation allowing entry into the plant through foliage and roots. Most micro-nutrient fertilizers on the market today are chelated with EDTA. EDTA, along with the metals it sequesters, is persistent in soil has been found decades after application. The organic acid used in the chelation of all Plant Essentials products breaks down rapidly in soil and presents no environmental concerns. SpeedyGreen organic acid chelating agent will not strip calcium from plant cell walls. SpeedyGreen is not toxic to plants when used as directed. Expect fast green up, and rest easy about environmental concerns.